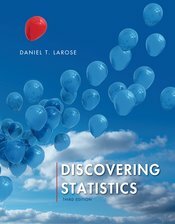 Dan Larose’s Discovering Statistics is the ideal text for instructors who want to teach the basics of statistical computation as well as how to interpret and apply the results of those computations. Using real data, contemporary examples, step-by-step solutions, extensive pedagogy, and support for common statistical software options, the text familiarizes students with essential computational skills, while helping them build the conceptual understanding needed to interpret and explain their findings. As a result, Discovering Statistics helps students develop a solid and lasting "statistical sense" that will prove valuable throughout their academic and professional careers.